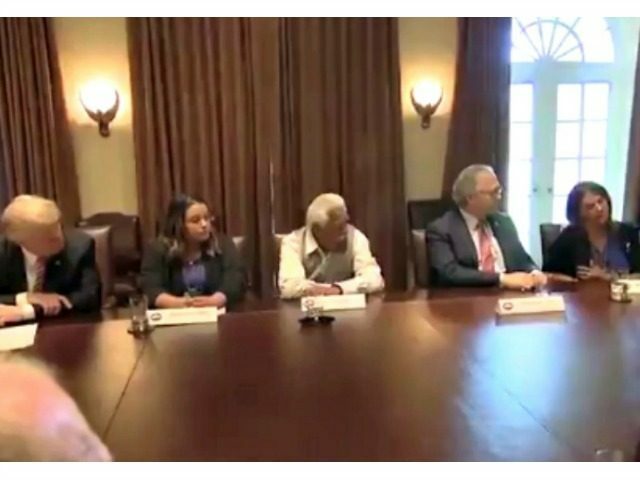 WASHINGTON, D.C. — Wednesday at the White House President Donald Trump hosted families that have loved ones who were killed by illegal aliens, as Congress prepares to vote on several immigration bills. Jamiel Shaw Sr., Sabine Durden, Michelle Wilson-Root, Steve Ronnenbeck, Mary Ann Mendoza, Dan Golvach, Julie Golvach, Laura Wilkerson, Melissa Oliver-Storz, and Juan Pina were among those who participated in the afternoon meeting. Trump turned attention to Shaw and the son lost when an illegal alien gang member just released from jail shot and killed Jamiel Shaw Jr.
“You lost the people that you love because our government refused to enforce our nation’s immigration laws. And that’s even the existing immigration laws, without new laws,” said Trump. Trump spoke about the Davis-Oliver Act, No Sanctuary for Criminals Act, and Kate’s Law during the event. Reps. Bob Goodlatte, Peter King, and Lou Barletta were present for the discussion with the immigration crime victims. Trump acknowledged each of them. Goodlatte is leading the effort behind the No Sanctuary for Criminals Act. Goodlatte affirmed to Trump that he would have enough votes to pass the bill. Debate continues on the host of immigration bills and what they will face should they move on to the Senate. Republican Congressman Andy Biggs told Breitbart News earlier in the week that he believed Grant’s Law would have the votes to pass in the House, but admitted he was unsure about whether it could pass in the U.S. Senate, where there is a much smaller Republican majority. “It’s time to support our police, to protect our families, and to save American lives. And also to start getting smart,” said Trump before calling on each of the family members who have lost their loved ones because of criminal aliens to tell their stories. Each one spoke of their lost loved ones. Many thanked Trump for taking on the issue of illegal immigration and for his work to see laws on the issue passed. After the meeting Durden told Breitbart News there was so much compassion in the room, calling it the best day of her life. She said they would like to see the border wall built and DACA rescinded, but added, “So much already happened. Where would we be if Hillary [Clinton] was in power? We wouldn’t even be acknowledged. You would have illegals …” She said she was very encouraged about the progress on the issue of illegal immigration under the Trump administration and expressed that they are patient to a “certain extent,” that things are moving quickly, and that Trump has not forgotten them.